I believe I've told you about my fascination with radishes. I am determined to make the radish a mainstream vegetable. How can something so crunchy, so beautiful, so refreshing be relegated to the role of perpetual garnish? I won't have it. Luckily, Duda Farm Fresh Foods agrees with me. They are going to great lengths to make radishes more appealing to Americans. 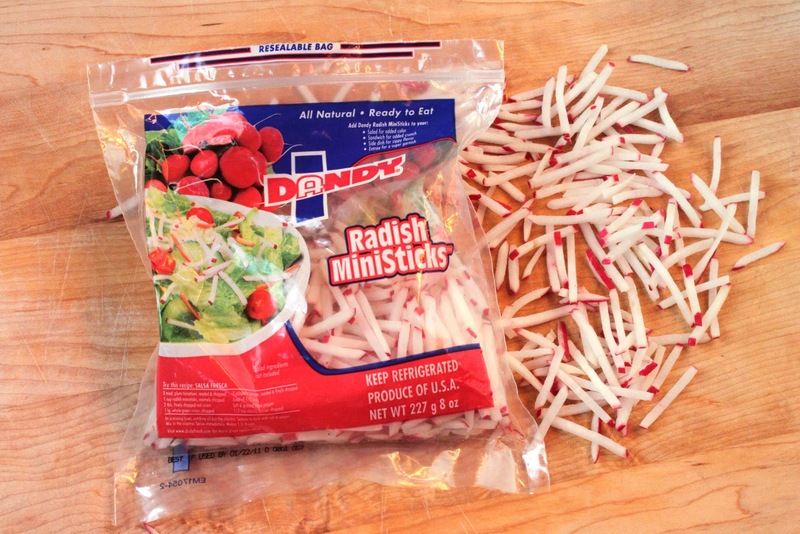 Last month they sent me a sample of their new Radish MiniSticks, radishes cut into thin batons. It was love at first sight. In fact, the entire package disappeared into the mouths of my family before I had a chance to snap even one photo. Red-faced, I had to ask for another sample so I could get some decent pictures for this post. 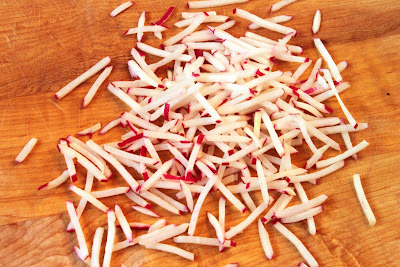 I've shredded my share of radishes using both hand graters and my food processor, and I haven't been able to replicate this particular cut. They're thin but retain plenty of crunch, and they don't wilt when dressed. 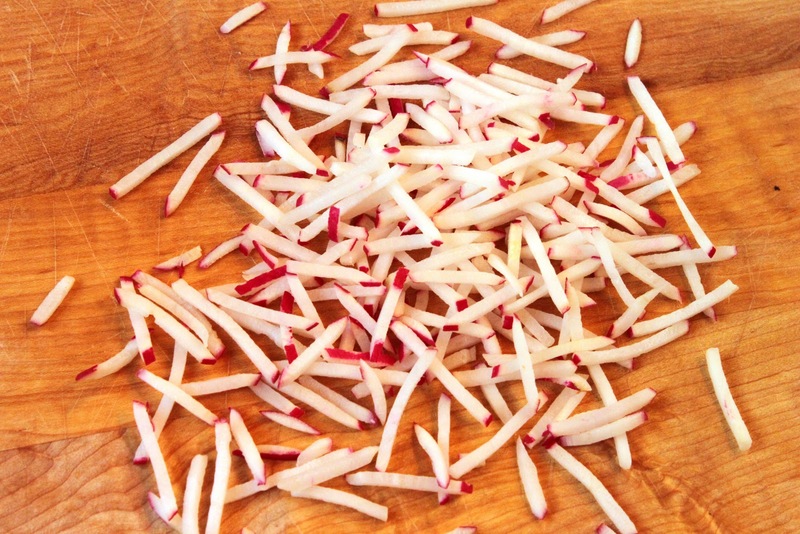 Normally I slice radishes thinly on a mandoline for my simple radish salad, but I used the MiniSticks with exactly the same dressing, and I liked the results even more. The MiniSticks worked beautifully mixed with truffle butter and spread on baguette slices, a variation on my radish truffle butter sandwiches, for which I also normally use thinly sliced radishes. I even added some to a batch of chicken salad on a whim. They're also excellent straight out of the bag. The Duda website has lots more suggestions, including cucumber radish raita, radish and lime ceviche with grilled shrimp, and a great-looking radish Greek yogurt dip (Super Bowl menu planning, anyone?). 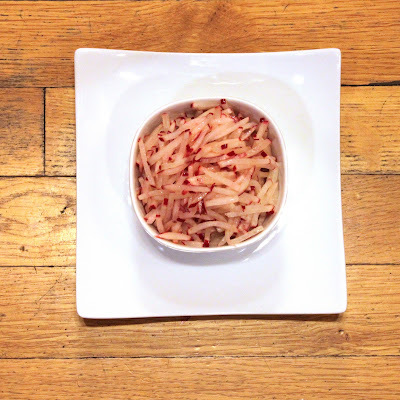 So the next time you're looking to change things up a bit in the vegetable department, think radishes. Whether you grab a bunch from the produce department or a bag of prepared radishes in the bagged salad aisle, you'll be adding color and crunch to your life. And I will have won one more battle in the Radish Wars. 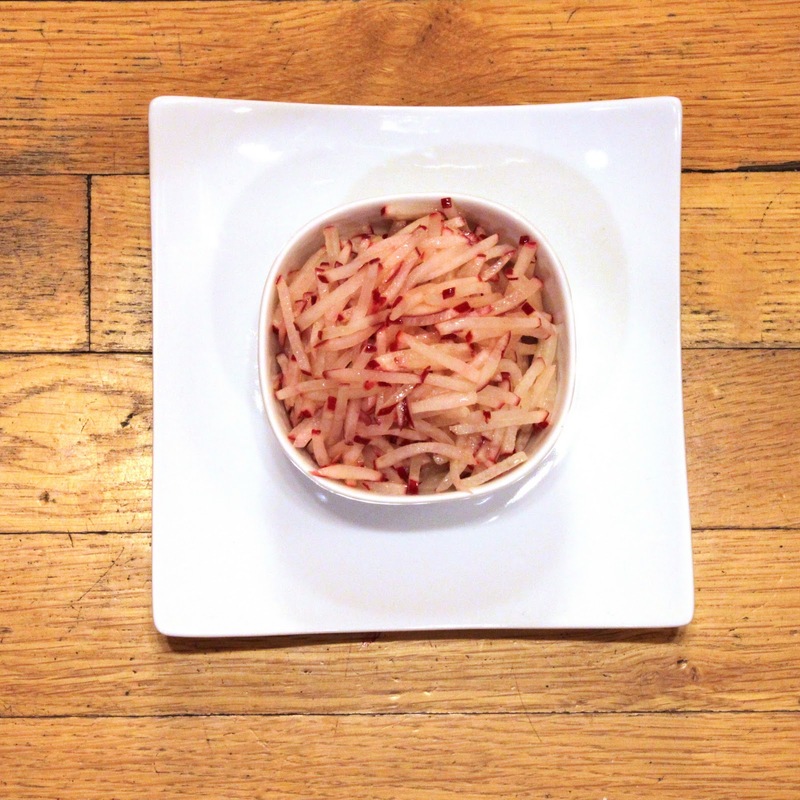 Thanks to Duda Farm Fresh Foods for the samples of Radish MiniSticks. Other than the free sample, I was not compensated in any way for this post. I just really love radishes. Radishes are so crunchy and peppery, love them. I'll have to look for this convienent packaging. My youngest daughter is going to be delighted! She is a radish fiend. It took me a while to convince my husband to allow radishes in the house - he told me that every time he planted radishes, he had to move. And he is NOT a superstitious type. But now we'd really like to move, so I will be buying a ton of radishes. I'm definitely a fan of radishes, although I don't use them often. I think that needs to change! These ministicks sound convenient and great! Terrific new product and great ideas on how to use the radish sticks. Anything that makes it easier to eat more veggies is a winner in my book! I love radishes and buy them all of the time. 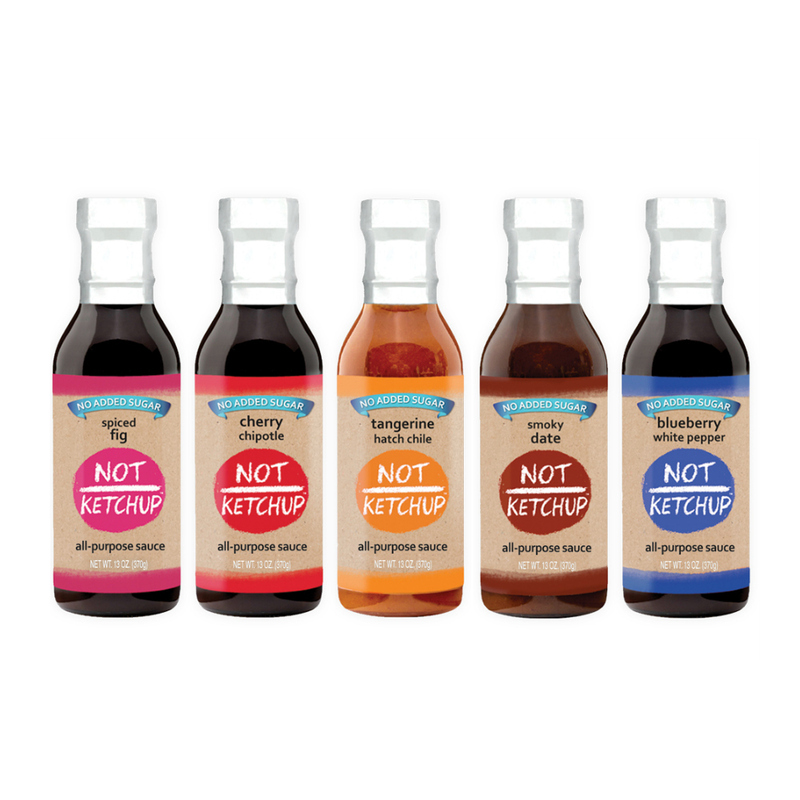 We want to help you find our Radish Ministicks! Where are you located? Erika, thank you for the shout out about our product! We're very excited! Wife just had these on an Oasis of the Seas cruise and loves them.........we live in Kitty Hawk NC......any chance to get them there? Anon - I just posted a request on the parent company's Facebook page asking them to come over and answer your question re: availability. Hang tight. where can we find them in the Los Angeles area?? @Tammy - I will reach out to the company and ask. Unfortunately they don't seem to have a locator on their website. @Tammy - the company has informed me that the Radish Mini-Sticks are no longer available in the LA area. BUMMER (for both of us!). I was wondering why I hadn't seen them recently.